A stalwart, mature investigation solution built for scale, speed and broad capabilities. 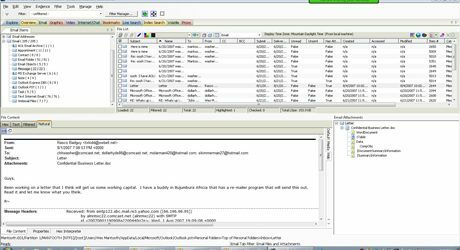 AccessData Enterprise is designed for thorough computer forensic examinations powered with comprehensive search functionality of both static and volatile data and able to reach multiple concurrent remote systems. AccessData Enterprise Incidentally response console enables rapid review and analysis of key volatile data elements across machines and across time. It Also Distribute processing supports workloads in the terabytes. This takes hours, instead of days. Incident response console enables rapid review and analysis of key volatile data elements across machines and across time. Quick preview and acquisition of static and volatile data. Large scale batch acquisition to streamline large, multi-node evidence collections. Large scale batch acquisition to streamline large, multi-node evidence collections. Uses market-leading integrated decryption, password recovery/ cracking technology. User audit-logging which includes connections to specific targets, data previews and data acquired. Easy-to-use data processing wizard automatically categorizes, indexes and exposes data. Supports E01 evidence files, DD and more. Point-and-click remediation capabilities to delete files, kill processes and more. Facilitate Regulatory Compliance and E-Discovery. Detect and Covertly Investigate Data Theft, Fraud and Other Employee Misconduct. Detect, Analyze and Remediate Malware, Advanced Persistent Threats and Zero-Day Events. Automated Malware Triage and Analysis. eSec Forte Technologies is an CMMi Level 3 | ISO 9001:2008 | ISO 27001-2013 certified Cyber Security Audit Company and IT Services Company with service offerings in Information Security like VAPT Services, Penetration Testing Services, Vulnerability Assessment Services , Amongst our clients we proudly count Government Organizations, Fortune 1000 Companies and several emerging companies. We are also Value Added Partners of AD Enterprise Network Investigation and Incident Response. We are headquartered in Gurugram, Mumbai, Delhi, Bangalore – India. Contact our sales team @ +91 124-4264666 you can also Drop us email at contact@esecforte.com for implementation of AD Enterprise Network Investigation and Incident Response Tool.